Economy, once a science for experts only, has become ubiquitous in the public debate after the toxic marriage between globalisation and the acceleration of its processes. Art and cultural institutions have soon entered this decisive debate, using their privileged position to gather different expertise and generate unconventional ideas. In the tradition of Baltan Laboratories, celebrating ten years of activities, this ”Economia” catalogue is a printed outcome of a whole program of activities, organised as a “festival about the economy without the economists (on stage)”. The aim of the event was to expose new ideas and strategies, in order to motivate the individual to actively re-appropriate the economy through both its knowledge and the mastery of its basic mechanisms. Artists, writers, activists, scientists, biologists, scholars and hackers have been invited to contribute with texts after their participation to the festival. The texts have been organised in three sections: Economy as a playful construct, Economy as a biological construct and Economy as a social construct. 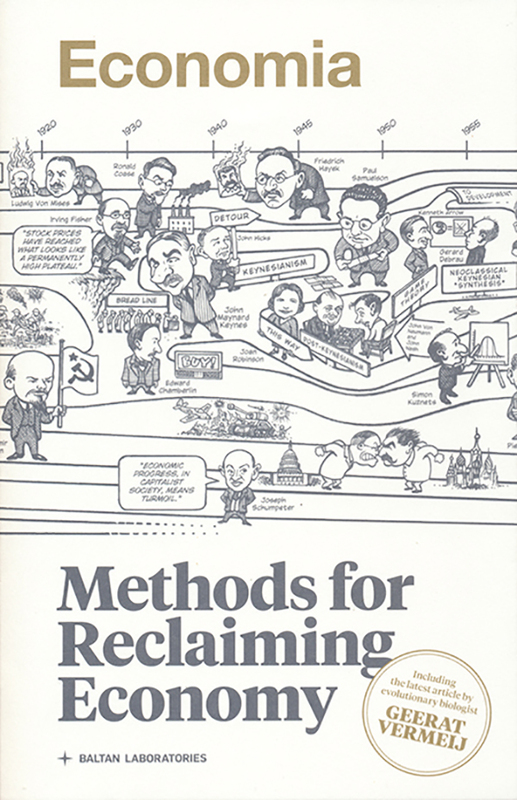 Then we can read about historical reconstructions as installations (like the Moniac), alternated with “hacktivism as a method for the critical exploration of bureaucracy”, alternative currencies based on our personal values, and the direct application of biological principles to economy systems. This reader comes with a small tabletop Currency Lab Game, both playful and critical, ideally embodying the multifaceted nature of this publication and its potential.